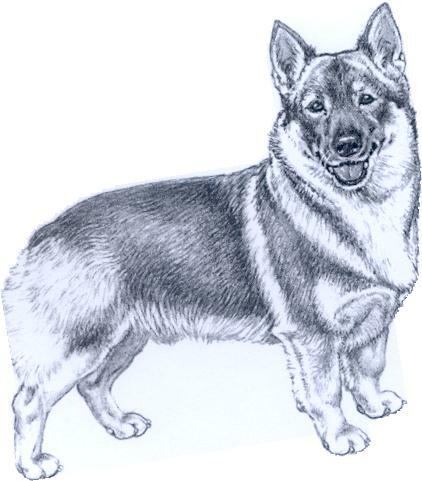 : The Swedish Vallhund is considered to be an authentic Swedish breed although uncertainty still exists as to the relationship with the type like the Welsh Corgi. Whether or not the Vikings brought Corgi-type dogs back from the British Isles to Sweden or Västgötaspets-like dogs from Sweden to Britain will never be solved. But modern research believes that the Västgötaspets is of Swedish origin. Regardless of the breed’s origin, credit for its recognition goes to Count Björn von Rosen. In the early 1940’s von Rosen was told that this old type of herding dog still existed and an investigation took place in the County of West Gotha. Particularly in the planes of Vara specimens of homogeneous type where found; few in numbers but enough to start breeding. Breed type was well established without loosing the working ability. : Small, low on legs and sturdy. Appearance and expression denote a watchful, alert and energetic dog. : Ratio of height at withers to length of body 23. The height from lowest part of chest to ground never to be less than 1/3 of the height at withers. : Watchful, energetic, fearless and alert. : Clean cut and fairly long. Skull and nose bridge parallel. : Viewed from above as well as from the side, moderately broad and tapering evenly towards the nose. : When viewed from the side, is rather blunt cut and only slightly shorter than the skull. : Well fitting and tightly closed. : Lower jaw rather blunt cut and strong, but not prominent. Perfect and regular scissors bite with complete, even and well developed teeth. : Medium size, oval in shape and dark brown. : Medium size, pointed, pricked and ear leather is hard from base to tip, smooth-haired and mobile. Length of ear should slightly exceed the width at base. : Long and strongly muscled with good reach. : Back level, well muscled. : Short, broad and strong. : Broad and slightly sloping. : Long with good depth. Fairly well sprung ribs. When viewed from the front, the chest is oval, from side, elliptical. It reaches two-fifths of the length of the forelegs and, when viewed from the side, the lowest point of the chest is immediately behind the back of elbow. Sternum visible but not excessively pronounced. : Two types of tails occur, long and all variations in length of naturally short tail. In both cases all variations of carriage are permitted as there is no norm for the carriage. : Long and set at an angle of 45 degrees to the horizontal plane. : Slightly shorter than the shoulders and set at a distinct angle. Upper arms lie close to ribs, but are still very mobile. : When viewed from the front, slightly bent, just enough to give them free action against the lower part of the chest. : Medium sized, short, oval, pointing straight foreward with strong pads, tightly knit and well knuckled up. : Broad and strongly muscled. : Only slightly longer than the distance from hock to ground. : Sound, with good reach and drive. : Top coat of moderate length, hard, tight and lying close to body, undercoat is soft and very dense. The coat is short on head and foreparts of the legs, may be longer on neck, throat, chest and backparts of the hindlegs. Grey, greyish brown, greyish yellow, reddish yellow or reddish brown. Lighter hair in the same nuance of colour as mentioned above can be seen on muzzle, throat, chest, belly, buttocks, feet and hocks. Darker guard hairs visible on back, neck and sides of the body. Lighter markings on shoulders, so called harness markings, and light cheek markings are highly desirable. Lack of two P1 or one P2. Light eyes giving wrong expression. Chest too deep or too shallow. Too short in upper arms. Lack of harness- or cheek markings. Lower jaw receding, narrow or weak. Lack of molars (M3 not taken into account). Soft coat and stand off coat. Coat too short or too long. White markings exceeding 30% of base colour. Height severely diverging from the ideal height. Hanging ears or semi-erect ears. Black, white, liver brown or blue coat colour.